40' Wooden boat created for the US Navy in 1941. After the war it was sold to fisherman. We purchased this boat when the Salmon fishing was in it's prime hoping to become Commercial Fishermen. We were told that all we needed to do was fill a few seams and we'd be in business. Little did we know at the time, all the rot that we would find on this vessel. 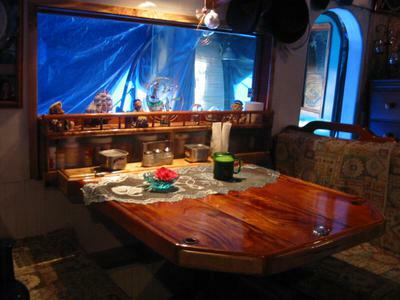 Off came the cabin, and most of the original hull, the deck was raised 18" to allow for more space in the engine room. As time went on, work on the boat was put on hold due to taking care of elderly family members. Then the fishing went to pot. We decided we'd like to live on this boat on the water. 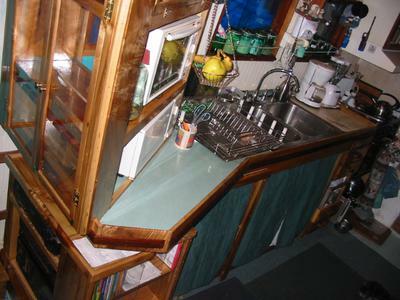 So it was becoming a beautiful yacht with myrtlewood cabinets in the galley, curved, laminated cedar beams with mahogany trim and mahogany galley table which makes into a bunk. Full stand up shower in a jetted tub in the head, secondary head in aft. In other words, it was being made "wife" friendly. In 2006, we were told we could no longer stay on the boat in drydock while working on it, and as we began taking care of an elderly mother, we bought a place inland. Working on the boat since then has been impossible due to physical problems and surgeries. Now the harbor is demanding that the boat be removed from dry-dock???? With no advance warning, we have 30 days to remove it. It is not float-able at this time as it still needs hull work done. There is no running gear and the engine is the original Buddha from 1940's and probably doesn't work. 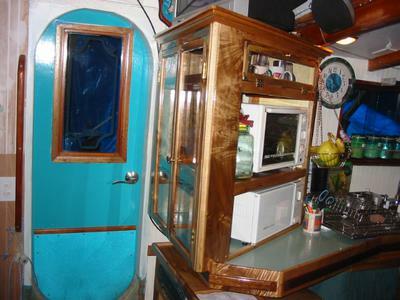 But it does make a lovely cabin - we wanted to put it in the Harbor and live aboard, however the Harbor ruled they didn't want any more live aboards. Would make a great man-cave if it could be moved somewhere. She is located in Winchester Bay, Oregon. I'm interested in the status of your babyboat. is this a current add? Yes, this boat is still available. It is in Oregon and would be best to move by loading on a barge. Give us your phone number so we can talk. Why don't you just cut off the ship in half and take the top half home and live in it. 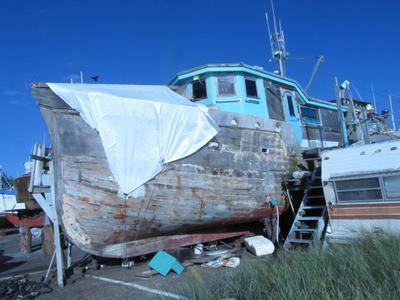 Yes, this boat still available and in desparate need of continued restoration. The drydock is working with us to buy us a little time. is the boat still looking for a new steward?